The 46AF is a free-field microphone set and as such optimized for all acoustic applications, where the location of the main sound source is known and the microphone can be pointed directly at it ensuring 0° incidence. The medium frequency makes it ideal for general diagnostics. 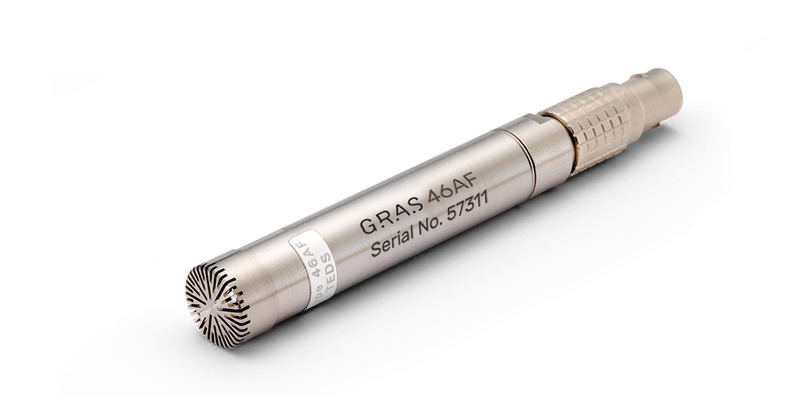 The GRAS 46AF is a high-performance standard microphone set. In our clean-room environment the set is assembled and sealed with a label. However, the microphone set can be dismounted, if you wish to use the components separately. The microphone cartridge is the high-quality IEC 61094 WS3F standardized GRAS 40AF 1/2" Externally Polarized Free-Field Microphone, designed for long-term reliability in multiple environments. To perform as specified, the GRAS 46AF microphone set requires a power module or an analyzer input which can supply the preamplifier with power as well as 200 V polarization. If the power supply is lower, the capability of driving long cables is reduced and consequently the upper frequency is reduced. If the voltage supply is lower it will influence the upper dynamic range. The 46AF is IEEE 1451.4 TEDS v. 1.0 compliant. If your measurement platform supports Transducer Electronic Data Sheets you will be able to read and write data like properties and calibration data. When our R&D team develops a measurement microphone, it must undergo the most demanding tests to prove that it can withstand our customers' daily test conditions. Using a series of Highly Accelerated Lifetime Tests (HALT) we ensure that our microphones live up to the high quality and precision that our customers have come to expect and trust. Our HALT tests actively accelerate the lifetime of a microphone by simulating the handling and use it is exposed to in real life situations. For more about HALT, see http://www.gras.dk/halt.